John Hansen, Mr. Natural Olympia and 3x Natural Mr. Universe, will guide you to developing your physique to look like a Classic Bodybuilder. John’s Old School Bodybuilding Training and Nutrition methods will develop and refine your body into a symmetrical and classic bodybuilder. John has over 40 years of experience in training and contest preparation and he will design a personalized training and nutrition program for YOUR physique. You will begin your journey by filling out a Training and Nutrition Questionnaire that will allow John to get acquainted with your individual body. John will write up a Training Program and Nutrition Plan to help you build muscle mass, reduce body fat and develop your body with perfect proportion and symmetry. John knows what it takes to change the look of your body, improve your weak points and emphasize your strong points. After your initial program, John will continue to guide you for as long as you wish with the Month to Month Consultations. John will check in with you EVERY Week (by phone, email or Skype) to review your workouts and diet. These weekly consults with your Coach will help to motivate you and keep you progressing week after week until you achieve your Ultimate Physique. What a great opportunity to work with an Expert like John Hansen to develop your physique! Yearly Special – Training and Nutrition Program and 12 Full Months of Follow-up Consultations (BEST DEAL!) – $2000.00 – Save $500.00!! “Natural Bodybuilding” is the ultimate book for the drug-free bodybuilder. Covering everything from training to nutrition to contest preparation, “Natural Bodybuilding” details all aspects of what it takes to develop a winning physique without steroids or other illegal drugs. Included in the book is a section on assessing your individual genetic potential, how to develop the ultimate mass-building workout, nutrition programs for all body types, the most effective supplements to take, exercise descriptions for all muscle groups including photos, how to construct a winning posing routine, what the judges look for in the physique during a competition, how to get psyched up and avoid getting psyched out backstage and so much more. John shares his extensive training and contest experience through detailed and easy to understand writing. “Natural Bodybuilding” will save you years of experimentation by providing you will all the knowledge you need to succeed! Price – $45.00 Plus $5.75 for Postage (limited quantities available as the book is no longer in print). Note – When ordering outside the United States, email your address to John for the proper amount of postage. 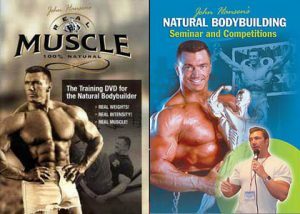 John Hansen, Mr. Natural Olympia, presents “REAL MUSCLE”, the Training DVD specifically designed for the Drug-Free Bodybuilder. You don’t need steroids to develop a massive physique but what you DO need is the knowledge and intensity of a champion. John Hansen has 25 years of bodybuilding experience winning the Mr. Natural Olympia, Natural Mr. Universe, Natural Mr. North America, Natural America’s Cup and Natural Illinois. He writes a monthly training and nutrition advice column for IRONMAN Magazine and is the author of the critically acclaimed book, “Natural Bodybuilding”. “REAL MUSCLE” features the exact training routine that John uses to build his championship physique. A full week of workouts are demonstrated on the DVD. Presented in a unique format, the “REAL MUSCLE” DVD provides both instruction and motivation for the Natural Bodybuilder. Each exercise is shown in two complete sets. The first set is the warm-up set in which John describes the correct form to use to get the maximum benefit from the exercise. Since the proper technique of each exercise is crucial in acquiring the maximum benefit from each movement, this section of the DVD is critical. The second set is the intensity set. This set is filmed in black and white in a real gym with real weights. John graphically demonstrates the type of intensity that is required to build REAL MUSCLE! You will feel the grit and determination as John trains with heavy weights using the basic exercises when you watch the intensity set on the “REAL MUSCLE” DVD. In Natural Bodybuilding Seminar and Competition John presents a 90 minute seminar that covers all aspects of drug-free bodybuilding. Included in this seminar is: How to Construct a Mass-Building Routine The Best Exercises for Building Size and Strength John’s Personal Mass Building Routine Nutrition Information on Protein, Carbohydrates and Fats How to put together a Bodybuilding Diet Pre-Contest Training Routines and Cardio Pre-Contest Diets for Losing Fat and Gaining Muscle.